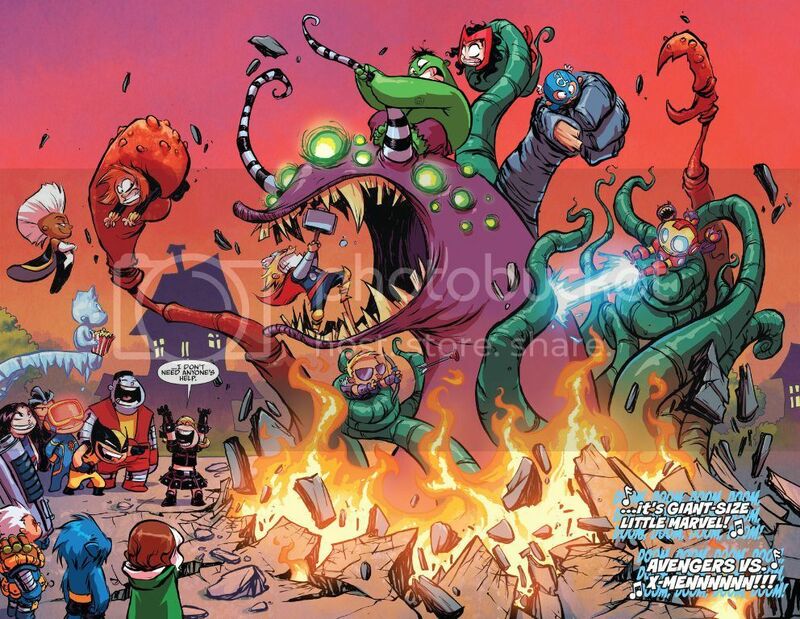 Giant-Size Little Marvel: AvX #1 Review: 9/10! I won’t even try and fake a different reason for why I bought this comic. 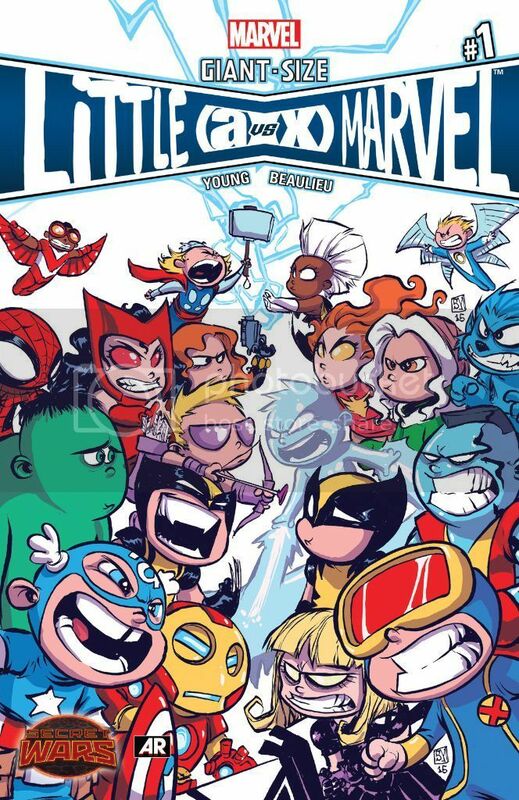 If there is ever a chance for me to get Skottie Young’s cover of a comic, I do. So when I was at my local comic shop and saw this, I knew I had to have it. A whole comic with his art? I was SOLD! Do you remember Muppet Babies or Baby Looney Tunes? This comic is along that same vein. It starts out with showing you all the different places on “Battleworld” and explaining it through what could only be appropriately described as a theme song, only to close the song and see the X-Men taunting and torturing the Avengers. With Cyclops as the leader of the X-Men and Captain America the leader of the Avengers the two are dueling over everything. Issue #1 has three acts, similar to a TV show, but only sets them apart by a small “the next day” or “a few hours later” in the corner instead of giving each act a new title as I’ve seen done before in “young” versions of comics. This comic heavily relies on its puns, but considering that the main characters are all children, it kind of makes sense. Cyclops frequently makes “eye” jokes (i.e., an eye for an eye… get it?) and thinks he’s hysterical, while Thor shows everyone what “hammer time” really means. The sass and snark of the characters is strong and almost distracts you from the fact that they’re essentially kids. Now for the main reason I picked up this comic. 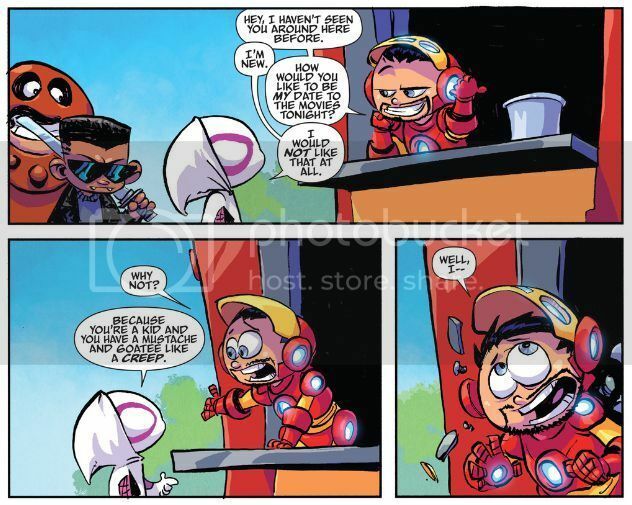 Skottie Young’s art. I appreciate that Young included not only newer characters (like Spider-Gwen) but also newer incarnations of older characters (like Storm and her badass mohawk). His art always makes me smile. From the gap in Cap’s teeth to the plastic plunger on the end of Hawkeye’s arrows, Young gets the details JUST right that you want to see more characters in this universe.